Each Mandarin teacher that is dispatched by Mandarin Garden holds the Mandarin Teaching Qualification Certificate which is internationally certified according to IPA and CETTIC international Standards. High quality teachers with experience in teaching Mandarin as a foreign language and Chinese culture. We have a strict selection and training process. 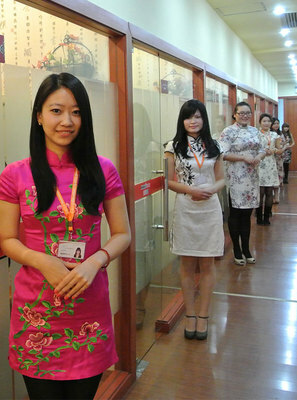 Each Mandarin teacher must take part in a 200-hour training program before he or she can conduct Mandarin lessons. To ensure teaching quality, each Mandarin teacher will receive on the job coaching and weekly evaluation. At Mandarin Garden, the professional standard is guaranteed. Our teachers are professional Mandarin teachers, graduates in language studies, or with overseas education exposures. We are well versed with international teaching skills and methodology. Our professional teaching team at Mandarin Garden is in the position to create teaching theory and design teaching skills and technology. Through our "role-play", "game and practice", "language pointers and substitution exercise", "memory practice", and our highly effective teaching material and various teaching tools, we are gaining praises and recognition for our process and results of Mandarin teaching from our clients and students. Our teachers can provide tailormade teaching programs according to our students’ needs and interests.We also provide regular term tests, professional evaluations and study reports.